NEWSBOX: Rushing to get those Sales bargains ? Can't find a parking spot ? Well if you come into Penarth you can still park right outside your favourite shops - and it's free for as much as 2 hours or more !! WELCOME to PENARTH. These pages aim to bring you accurate and comprehensive information about this pleasant seaside town, one of Wales' premier resorts. 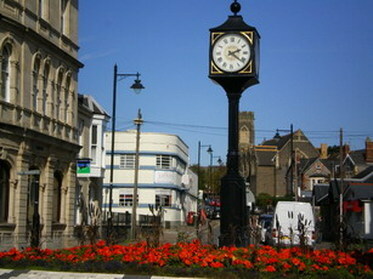 PENARTH has a wide range of facilities and these are listed on the pages on the above. Whether it be Accommodation, somewhere to visit for the day, finding a friendly shop where the owner will both greet and talk to you, see what sports you can play or watch or indeed anything else, VisitPenarth is the place to be ! Oh ! and the latest News and Weather are down below for you as well. 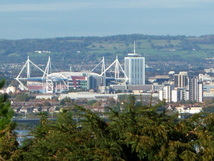 PENARTH is located just 10-15 minutes from Cardiff City Centre, and here you can see the Millenium Stadium and many other city buildings, whilst in the distance is The Wenallt, a superb open air park on the mountain top. 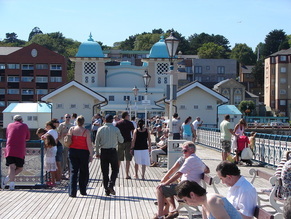 Penarth Pier is completely refurbished and open to the public free of charge. In the summer months, pleasure craft may call at the pier to take passengers on local trips and cruises. On Summer Sundays, local Brass Bands play on the pier. There is much to do in and around Penarth and this site will give you some idea of what these are. Save £££ whilst Shopping in PENARTH - Buy yourself a shiny new SHOP PENARTH card for only £2 and check online at www.shoppenarth.co.uk for the multitude of super offers available NOW. Discounts on Food, Services and even Accomodation are available from over 50 retail outlets in the town. Buy a card at all good stores in Penarth or Online. Watch PENARTH during the 50th Year Summer Fest in 2015 - All the thrills and fun ! Last Vulcan flights ever visit Penarth in July 2015.